Back to the 80s: Q is for Queen. There was never any doubt which band I’d use this time around for my A-Z Challenge. Queen are one of the all time greats and an old favourite. Sadly, I never did get to see them in concert, which would have been awesome. Queen were formed in London in 1970 and released their debut album in 1973. In 1975, they released their fourth album, A Night at the Opera, featuring ‘Bohemian Rhapsody’, which has been voted one of the greatest songs of all time. 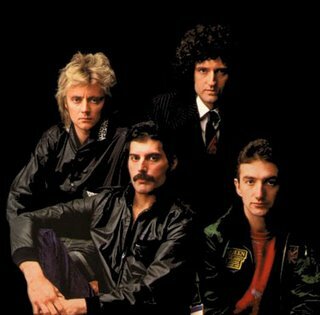 Queen released three more albums during the 1970s, making them an international success. They toured the US, Canada, Japan and Europe and performed a free concert tour in Hyde Park, London. The 1980s were a time of experimentation for the band, including the use of synthesisers, writing movie soundtracks (Flash Gordon) and a collaboration with David Bowie on the single ‘Under Pressure’, reaching No.1 in the UK. In 1985, they performed at the Live Aid concert, with a television audience of over one billion. In 1986, they released the album A Kind of Magic, which proved very successful and included songs from the movie Highlander. That same year, they went on tour, which was also to be their final one with Freddie Mercury. Freddie’s health was brought into question in 1988, and despite being diagnosed with AIDS, he denied anything was wrong. The band continued to record during this time, releasing two more albums and a second compilation album. Within hours of confirming he had AIDS, Freddie Mercury died in November, 1991. A year later, a concert was performed in his honour, raising money for AIDS charities. Their final album featuring Freddie was released in 1995, reaching No.1 in the UK and has sold over 20 million copies world wide. A statue of Freddie was unveiled in 1996 in Geneva, Switzerland. In 1997, John Deacon chose to retire, while Brian May and Roger Taylor continue to perform to this day. Of-course I had to put this song on my playlist (love Highlander)! And yes, there can only be one Freddie. We may never see his like again. May he rest in peace. Other bands formed or who had hits in the 1980s starting with the letter Q include:- Quiet Riot. Are you a Highlander fan? What other bands of the 1980s that begin with the letter Q can you think of? Previous Post The Slow Horror of The Orphanage. Next Post Has Your Writing Ever Surprised You?